Here is the complete list of Android Smartphones which will be getting Android 6.0 Marshmallow update. List for Marshmallow update includes Samsung, Nexus, LG, Sony, Xperia, YU, Micromax, Gionee, Google Android One, Motorola Moto, HTC, Asus Zenfone, OnePlus, Xiaomi, Xolo, Lava, Huawei, ZTE, BLU Products, Oppo, Meizu, Infocus, Intex, Acer, Qiku, LeTV LEECO and Alcatel One Touch Phones. Some Manufacturers might skip Android 4.4 KitKat or Android 5.1 Lollipop update and would directly offer 6.0 Marshmallow update. Official release dates for this updates is not known but would be arrive in between mid of 2016. Some of the devices are confirmed while some are not. 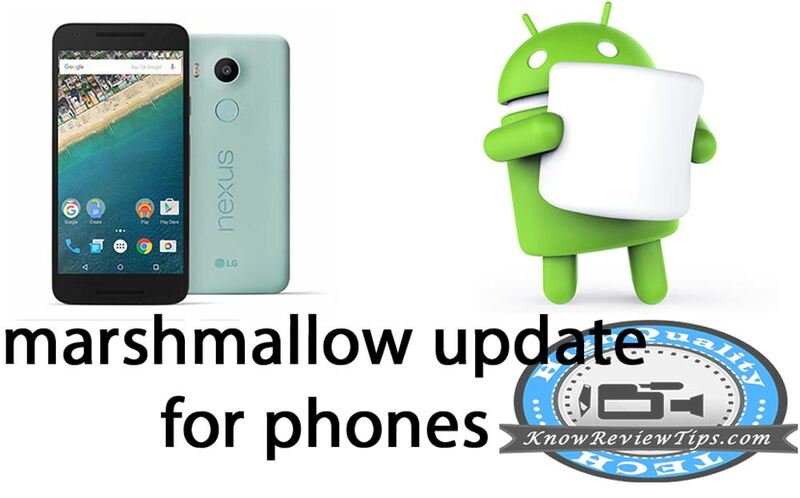 We have also written the phones which have high chances of receiving the 6.0 Marshmallow update. All Google Android Phones will get Android 6.0 Marshmallow update. Motorola Moto E ( E 1st gen, E2 2nd gen, Moto E3 4G 3rd gen is not Getting Android Marshmallow update). Moto G 3nd gen Dual SIM will be getting update in India, Europe, Canada, USA, Australia, New Zealand, Philippines, United Kingdom, Pakistan, Europe, Japan, China, Korea, Malaysia and other countries before 2017. It is not confirmed that whether the Galaxy J3, Galaxy J5 SM-J500F, Galaxy J5 2016 SM-J510F, Galaxy J7 SM-J700F/ SM-J700H ( highly popular), Galaxy J7 2016 SM-J710F , Galaxy J76, Galaxy J2 2016 J210F J200H / J200Y, J26, J36, Galaxy J3 2016, Samsung Galaxy S5 SM-G900H, Samsung Galaxy Grand Prime (models : SM-G530F, G530FZ, G530Y / SM-G530H, G530FZ/DS) are Getting the Marshmallow update or not. The same goes for Samsung Galaxy A5 (SM-A500F, A500F1, A500FQ, A500FU, A500H, A500HQ, A500K, A500L, A500M, A500S, A500X, A500XZ, A500Y, A500YZ) and Samsung Galaxy A3 SM-A300F as well. Sony Xperia Z LTE C6603 /C6602, Sony Xperia C3 D2533, Xperia M2, Xperia E4, Xperia T2 Ultra, Sony Xperia C HSPA+ C2305 and other are not getting the Official Android Marshmallow 6.0 update from the company. The LG Nexus 4 , LG G Pro 2, Spirint, G2, G Flex 1st generation, LG K10, Zero, L Bello might not be getting the update. Lenovo P70, Lenovo Vibe K5 Plus, A6000 Plus / A6000-A, A7000 Plus / A7000a, Vibe P1m, Vibe X3, Vibe Shot and Vibe P1 / S1 might also get the update but chances are less than the above ones. The first two phones in the list should definatelly be getting the marshmallow update in 2016, while the other also have chances of getting the update. ZTE Blade S6, Qlux 4G A430 and Blade L2 / L3 might not get the update. Huwaei Honor 4C, Huawei Y6 Pro and Honor 4X might also get the update but has less probability than the above phones. All the OnePlus phone are going to have Marshmallow 6.0 update in 2016. The phones includes, Oneplus X, Oneplus One, OnePlus Two. Xiaomi Redmi 1s, Redmi Note 4G, Mi-3 might get the update but chances are very less. Yu appears to be more promising on providing updates for their phones than the Micromax. Yu is also offering 6 lakh price money to volunteer developer who will make Android 6.0 Marshmallow update for Yu Yuphoria Yu5101, Yu Yutopia, Yu Yureka Plus YU5510 / A05510, Yureka Note, Yunicorn and Yu Yunique Plus YU4711. So we can expect the updates in mid 2016. Yu might launch the Yu Yutopia as their first Phone running on Android 6.0. There are very Less chances for the Micromax Unite 2 A106, Micromax Canvas 6, Micromax Canvas 6 Pro E484, Canvas Unite 4 Pro, Canvas Xpress 2 E313, Canvas Juice 2 AQ5001 and for Canvas Doodle 4 Q391 for getting the Marshmallow update. But as XDA developers community is very active so there is chance to port custom ROMs on these smartphones. BLU has already rolled out the Android 4.4 KitKat update for the Blu Neo 4.5, BLU Dash 5.5, Studio 6.0 HD, Blu Life 8, Blu Life Play and Vivo IV. Here is the of the phones which might get android Android 5.0 Lollipop or Marshmallow update. Intex Aqua Ace is the only phone which has high probability of getting the Android 6.0 Marshmallow update. Xolo Black 1X, Xolo Black, Omega 5.5, Xolo Black 1X, ERA X, ERA 4K and Hive 8X-1000 might get marshmallow update in future as they are highly popular smartphones from the company. Lava X10 Iris, Era 4G and Lava Pixel V2 might also get Android marshmallow update. Gionee Marathon M5 Lite, S7, Gionee Elife S6, Gionee S6 Pro, M6 Plus Elife S Plus, Elife E8 (very high chances), Elife S7, Elife E7, Marathon M5 and Marathon M4 could get the Marshmallow update by the end of 2016. Acer is great and popular mobile manufacturer known for its quality and affordable products. Acer Liquid Z630S, Acer Liquid Zest, Liquid Z630 and Acer Liquid Z530S has some chances of the getting android 6.0 update. Quiku Qtera will also be getting the Android 6.0 Marshmallow update in 2016. Both LE 1S and LeTv LE 1Pro has chances of receiving the Marshmallow update before the 2017. LeTV might launch LETV LE MAX / Superpone as there first first smartphone running on Android 6.0. Alcatel Phones which has chances of getting the Marshmallow update by the end of 2016 are Alcatel Flash 2 OneTouch, Fierce XL, Alcatel X1, One Touch Idol 3 5.5 / 4.7 and Flash Plus (Lollipop). Infocus M810, M535, M812, M810, M808 also predicated to be getting the Android 6.0 Marshmallow update. So on your list of Blu Product phones being updated...there is some serious confusion. There is a Pure XL and a Life XL but there is no Blu Pure Life XL. There is also no Life One 2015, but a Life One X. There is no Life 8 XL but there is a Life X8. I also just got off the phone with the company headquarters to inquire about updates to the Pure XL phone and was told that at this time their software team has not released any confirmation of when or even if any of the Blu Product phones will be upgraded to 6.0 Marshmallow. Will Letv le 1s confirmed get android marshmallow ?? what about oppo f1 plus it can change loolipop to Marshmallow or not . Well it depends on the company. As it is not high end smartphone and is having mediatek processor so chances are bit less.